For many years now dealers and collectors have been clamoring for an updated edition of Dr. Douglas B. Ball’s treatise on Confederate bonds. Their cries have been heard and their prayers have finally been answered. Though Dr. Ball passed away in 2003, Dr. Henry F. Simmons, Jr. has admirably stepped forward to correct numerous errors that were discovered after the publication of first edition, and to create a significantly more collector friendly work describing these fascinating financial documents. Though retaining as much of Dr. Ball’s initial research and structure as possible, Dr. Simmons has made the historical aspects of the bonds and their authorizing Congressional acts more understandable to the layman and specialist alike. 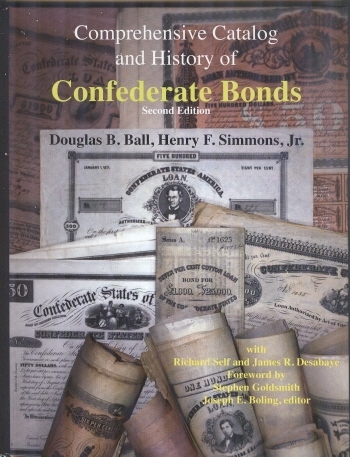 Additional items have been added to the introductory text including short biographies of the principal individuals depicted on the bonds, as well as expanded general information regarding bond sizes, the type and quality of the paper used in their production, and how to determine when a bond is historically accurate or has been altered since its issuance. These topics are presented with the collector in mind, though the specialists and dealers will undoubtedly discover something new. As in Dr. Ball’s original work, the body of this book, over 200 pages, is devoted to the cataloguing of the actual bonds. These are arranged by the Confederate Congressional act under which they were issued, with an historical perspective of each act at the beginning of the representative bonds. Pertinent information for each bond is provided, including the number issued, the date of issue and maturation, the printer, with variations noted to each of the main types. Additional information is provided regarding the bonds issued in the Trans-Mississippi Department, as well as an expanded section on counterfeit bonds. Dr. Ball’s original catalogue numbers have been retained throughout, since many dealers and auction houses have adopted this system for their catalogues and sales. This numbering system is considerably more detailed than that used in Grover Criswell’s earlier work, though Criswell numbers are still found on bonds in many dealers’ inventories. A cross reference listing the Criswell-Ball and Ball-Criswell numbering systems is included at the close of the actual bond list, thereby facilitating the identification of any bond the collector may encounter. In contrast to Dr. Ball’s work, the bonds in this book are illustrated in color, with numerous close-ups still being used to highlight the differences of the various sub-types. A rarity scale listing estimated extant specimens is included, with each bond being assigned a corresponding rarity number. Values are presented in two grades, with additional factors affecting the price being noted and explained. Illustrations, also in color, of select state issued bonds provide an interesting conclusion to this much needed update. Whether you are a serious collector of Confederate bonds or have just a passing interest, this book is for you. Order yours today.